Hubert de Castella's passion for the Yarra Valley saw him establish the St Huberts vineyard in 1862. In 1880 St Huberts won Emperor Wilhelm 1 of Germany's award for the most successful exhibitor at the Melbourne International Exhibition, an outstanding achievement. The onset of the Great Depression in the 1920's precipitated the rapid decline of St Huberts, and in the 1920's the land, reverted to grazing and dairy production. In 1966 replanting occurred at the present site, and there are currently 21 hectares under vine. The St Huberts vineyard is placed on one of the best viticultural sites in the Yarra Valley. The land is gently sloping, thus maximizing drainage and preventing the vines from getting wet feet or water logged roots that can lead to rotting of the root system. The northwest aspect of the vineyard maximises the exposure to the sun, vital for ripening in a cool climate region. Rainfall is about 900mm per annum. Due to the fact that most of the rainfall is winter dominated, the likelihood of botrytis setting in during harvest is minimized. The winter rainfall is collected in a dam and then used for irrigation as required in summer using a trickIe irrigation system. The area is generally free of frost in spring although a severe late frost can be experienced once every 10 -15 years. This is usually associated with the El Nino weather pattern. The soil is well drained grey clay loam over a clay layer of 500 - 600mm depth, however it is relatively deficient in some nutrients, thus the vines are not overly vigorous. Fertilizer is applied every two - three years to replace the nutrients that the vines take out of the soil. 120 years ago St. Huberts wines were the toast of the colony, winning awards internationally, as well as mightily pleasing the grandees back home. Today, the oldest vines on the property were planted in 1966 and generally yield low crops with intense fruit flavour and great depth of colour. A tribute to the quality is the assertion by most winemakers in the area that these vines produce the best Cabernet Sauvignon in the Yarra Valley. The individual vineyard parcels are painstakingly fermented in a range of fermentation vessels in order to enhance the differing flavour and tannin profiles of the Cabernet. These parcels are separated and racked into new and seasoned French oak for fifteen months, to develop the complexity of the wine. The finest oaks are selected to showcase the varietal fruit of the finished Cabernet wine. To maximise fruit exposure to the sun, a number of trellis types are used, including Scott Henry and the Hanging Cane trellis. Although some of these systems are labour intensive, they assist in improving fruit quality, yield and reduce the need for sprays. 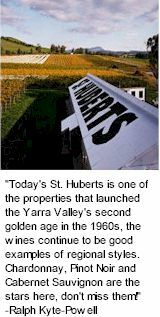 The St Huberts wines of today are a reflection of the one of the best vineyard sites in the Yarra Valley. The Estate Vineyard at St Huberts has long been considered one of the finest spots in the valley for Cabernet Sauvignon. The St Huberts wines are all about complexity and soft, ripe flavours.